�Saida Virga-Aurea.�By some it is called Woundwort. 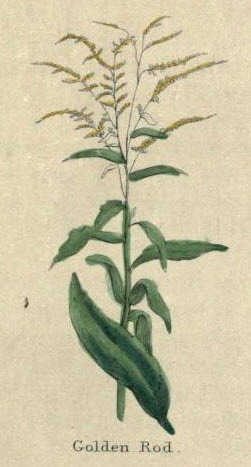 It has small round stalks, two feet high, having many narrow and long dark green leaves, undented about the edges, and without stalks or white spots therein, yet they are sometimes divided at the tops into many small branches, with small yellow flowers on every one of them, which are all turned one way. The seeds are downy. The root consists of many small fibres. It grows in the open places of woods and copses, on heaths, and it is cultivated in gardens. -Arnoldus de Villa Nova commends it much against stone, and to provoke urine in abundance, by which gravel and stone may be voided. The decoction of the herb, green or dry, or the distilled water, is very effectual for inward bruises; outwardly applied, it arrests bleeding in any part of the body, and of wounds; also the fluxes of humours, the bloody flux, and women's courses; and is no less prevalent in ruptures or burstings, drank inwardly and outwardly applied. It is a sovereign wound herb, inferior to none for inward and outward hurts; green wounds, old sores and ulcers, are quickly cured with it. It makes an excellent lotion for sores or Ulcers in the mouth, throat, or privy parts in man or woman. The decoction tends to fasten loose teeth.